These really sound delicious. I love that flavor combination. I’m definitely going to have to try fennel in my chai spice mix soon. I usually just use allspice and I think the flavor varition would be a nice change. Okay, I’m DEFINATELY going to have to figure out a gluten-free rendition of that! These cupcakes sound delicious!! I can’t wait to try them! :-D But I’ll need some help… Oohh…. Chockylit! =) I’m very happy to report that I got one of your delicious chocolate recipes to work for me, Peanut Butter-Banana Chocolate Cupcakes with Caramel Glaze and a Caramelized Banana Disk. They were outstanding! I made them for a teen-aged friend of mine for her school-lunch-break b-day party. She was so proud, because they went back to school and told everyone that they had “the best cupcakes ever!” They were so fudgy… Yum! Back to help… How can I make this recipe omitting the banana? I want to use it for this recipe and also the Cherry Chocolate Cupcakes with Fennel Meringue Frosting. I tried the Vietnamese Coffee Cupcakes on Thursday. They were awesome!! I unfortunately had to play with the recipe. I asked the Vietnamese people that do my nails where I can get some Vietnamese coffee. They said I had to drive to Cleveland, an hour and 15 minute trip. But one of the new people ran in the back and made me a cup of instant Vietnamese coffee and gave me a pack to take home! So, I ended up using the 3-in-1 instant coffee and folding in espresso. They came out delicious, but fell a little too far after baking. :-( I decided to make a chocolate buttercream filling to cut out some of the denseness of the cupcake. Delicious! Since I’m not too good at whipped cream topping (does anyone get this to hold up for more than an hour or two?? ), I made a light whipped vanilla buttercream with egg whites. Ok, fine… I bought it from the bakery! hehehe X-) I made the top flat, sprinkled espresso on top, made a star, topped it with a coffee bean and stuck in a coffee stir. They were awesome. I took some back to the Vietnamese people. They loved them!! They can’t believe how much they actually tasted like Vietnamese coffee. Thanks for the awesome recipes… I’m working on trying all your cupcakes. your recipes always inspire me..
I’m so glad I found this site! I had no idea there were so many people out there that love cupcakes as much as I do!!! You make amazing cupcakes and I can’t wait to try some of your recipes! I tried making the buttercream frosting and had problems with the consistency. Did you bring the milk and butter to room temperature? It was also very warm in the apartment when I was making this, so I wonder if that had something to do with it. It almost looked curdled(? ), not smooth and creamy like your picture. Sometimes when you make buttercream the curdled look isn’t the end of your buttercream. It may just need to be beaten soft. I have a kitchen aid and use the paddle attachment on slow and it always comes back to life. I am pretty sure that the butter should be softened before you start beating the buttercream. 1hr at room temperature seems to work for me. Kim, Those are great suggestions. I find in general that if I add ingredients (especially liquids) too quickly to anything (batters or frostings) it might curdle, but with some continued mixing, things resolved themselves. mollie, i totally know how it is. i love strauss products and plugra, but with the number of cupcakes i make i would go broke! i normally use clover organic. i try to stay organic, but not as expensive as the good stuff. i like king arthur unbleached flour. i am picky for sure about chocolate. that has to be good. i actually like valhrona a lot, both the chocolate and the cocoa. i have been planning on getting farm fresh eggs, but lately i get organic eggs from whole foods. Your suggestions were very much appreciated. These and the lime and coconut cupcakes sound like they might be just what we are looking for! Chockylit I may never eat storebought goods again. I just finished creating a batch of these decadent and delicious cupcakes. My cousin’s Bridal Shower is tomorrow night and I cannot wait for everyone to sample these with a lovely cup of Earl Grey Tea. The just-ground Chai with Fennel is the crowning touch. I made a little extra for tomorrow morning – I am going to have some strong black tea boiled in milk with these spices of yours. I almost want to go to bed sooner! I cannot tell you how incredibly scrumptious these cupcakes are. The taste is so sophisticated and dramatic. Unbelievable. You are a culinary genius!! I’ve been able to find the nut & party cups, but I am not having a lot of success using them. Every batch of cupcakes I’ve made in them have completely overflowed the cups by about 15 minutes into the baking. Today, I was very careful to only fill the cups 2/3 full — which weighed out to 1 and 3/4 oz. of batter. Still had the same problem. Any suggestions? What a great blog! Congratulations! I’m definitely trying your recipes and you should definitely get published too with all your tasteful photos and recipes. Gorgeous recipes, thank you for you great blog! Miss Scarlett, I am so glad they worked for you! Yay! Hatton, I lot can figure into this problem. I doubt its the cups (I have had a similar outcome on occasions with plain cupcake papers, nut & party cups, and even ice cream cones). A couple things to look out for are for one, oven temp. If the oven is at the wrong temperature (in this case it sounds not hot enough) cupcakes can get a little wonky. Test your oven with a thermometer if you haven’t already. Otherwise, watch the amount of leavener you are using (don’t add extra) and don’t over beat in the last step. Good luck! Mayakins, let’s see… Tips for a newbie… Well, firstly, I strongly recommend measuring out everything in advance and making sure that all ingredients come to room temperature. This is a critical step in the process and requires forthought. Just this alone and following a good recipe, should help you get a good cake texture. With frosting, the important thing is consistency (it needs to be thick enough to retain its shape) and for that you end up with something very sweet. To be honest, it also takes practice to get a feel for consistency and get confident in your piping ability. ooishigal, thank you for adding the link. happy cupcake baking! hi Chockylit, i was wondering what kind of flour you use in this recipe? I attempted these cupcakes last night assuming you used plain flour rather than self-raisng, however unfortunately they were a complete failure! They all fell (even without opening the oven door) and were not very cupcake-y at all. I am at a loss to explain what happened. Help!! i definitely followed the instructions very carefully. Maybe my oven wasn’t hot enough? i heated it at 180 degrees Celsius (350 F) while i was preparing the batter…hmmm it’s a bit of a mystery! Still, even with all the trouble i had, my housemates still loved the flavour of the pseudo-cupcakes. I really want to give these another go, i am determined to get them right! Thanks for your help! Finally found the time to explore more of your blog this weekend and got the answers to my questions in my previous comment. Thanks and can’t wait for your next installment! amy, where are you from? There can be a huge difference in flours just here in the US, and even more differences in other countries — it could just be a semantics issue (i.e., what we call all-purpose flour might be totally different from what you call plain flour), but the amount of protein a flour has can make or break a cake. I wonder if there’s a way you can find out how much protein the flour brand you’re using has, and we could compare it to the brands here in the US. Here, at least, they don’t usually list the amount of protein on the bag, you have to look for it online or contact the company directly. I am currently addicted to chai tea — drinking litres of it everyday. So this recipe is more than welcomed. By the way, you’re totally excused for ‘cheating’. The cupcakes look so moist and deep-flavoured! thanks for the idea bout checking level of protein in the flour – i will give it a go. i made these. everyone loved them! they are sooooo good! Amy – of course! Duh — I’m sorry, I got all caught up in the abstract idea of the different flours, and didn’t think about the fact that you’ve probably converted all sorts of recipes (while I’ve converted none). It comes from having just read the flour chapter in Shirley Corriher’s fascinating book Cookwise and wanting to share my knowledge with the entire baking world, and be helpful. Oh yum! that sounds too good to be true! I think I am in love! These sound so delicious, and I can’t wait to try them out! One problem though…I don’t know what Valrhona 61% cacao is. Presumably this is chocolate, with Valrhona being the brand name. I have no idea where to buy Valrhona chocolate in Canada, or if it’s even available here. So I could substitute with another brand of chocolate…but should it be unsweetened? Semi-sweet? Sweet? Luckily, I have all three versions in my cupboard, so as soon as I can figure out what to use, I can make these! You can use any brand and whether you use what is called “bittersweet” or “semisweet” is your preference. Semisweet has more sugar so the end product would be sweeter. I recommend a high quality bittersweet chocolate for this recipe. I love to cook and I joke that I ruin anything I bake with flour. Soooo because of that I am shy about buying all of the great ingredients because I think I will ruin it all (literally 95% failure rate in baking). So to cushion myself I baked your Chai cupcakes with some cheating. I used a chocolate cake mix and a Chai mix too. And wow! was it good. Sure no where near as good as using the ingredients you have but it was fun and your idea was very inspirational. Have you ever made anything using Hibiscus flower? It is my latest favorite ingredient. You can buy it in bulk at Whole Foods or any Mexican grocery store. I would love to see what you would do with it. I used the little cups, and those are adorable! just found your site and am now addicted! 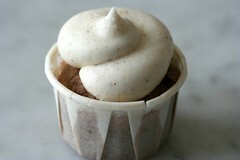 This Chai cupcake sounds great.I might try using the Chai powder drink mixes from Borders bookstore. this looks amazing! really! what a great idea and wonderful combination of yummy choc and the flavorful spices. Love the look of this recipe! I’ve never done Fennel in my chai, though I’ve got a mix of the other spices that I have at work. Do you think this would work as well in a vanilla cupcake, instead of a chocolate? I’d love to make these for my friends and one of them is allergic (and HATES the fake stuff). This might be a very dumb question. I was thinking of making this with a basic cream cheese frosting but adding the chai spice mix and ginger to it instead of the standard vanilla. I am a frosting newbie so I don’t know, will that just taste gross? Should I not even go there? not dumb at all, that is basically all it takes. one tip.. start light when you add the spices and adjust to taste. i just wanted to thank you so much for this recipe. i made it twice with a cream cheese frosting sans ginger, once for a dinner party and once for a friend’s birthday. the second time, i made a half recipe and substituted a 1/4 cup of mayo for half a stick of butter (i stole the idea from michael chiarello) for a slightly moister cupcake, just to experiment. both times, the cupcakes were DEVOURED. verdict from friends: these are the best cupcakes EVER. thanks for the feedback, batty, that is awesome to hear. i will have to try the mayo thing some time soon. 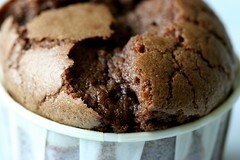 I have baked this chocolate base recipe twice and have had the same problem both times – they overflow and then sink. They taste fine of course but look absolutely horrible! I was baking them for a baby shower last weekend and, after the first tray failed, I had to do an emergency fix by adding some milk and flour. These came out drier than I’d liked but looked presentable enough. Do you have any idea what might be going wrong? The first time I baked them they had a crust on top (I thought too much egg white, as I use quite large free range eggs) so the second time I reduced the eight eggs to six. I was also careful to fill them only halfway, but I still had the same problem. I stumbled on this through Google in search of an interesting cupcake recipe and I feel like I landed in cupcake heaven. Great blog. 1) Make sure your over temperature is correct. If it is too low, many cupcake recipes will overflow. I recommend getting a thermometer for the oven and making sure it is really at 350. 2) Cupcakes must be cooked completely (tester must come out clean – no crumbs) or the cupcakes are likely not baked enough and will not be able to hold themselves up and will sink. Firstly, do not disturb the cupcakes for the first 15 minutes fo baking, then towards the end of the baking cycle (~20 minutes for regular sized) check frequently for doneness. Lastly, I don’t use dutch process, just regular unsweetened. I have never heard of having to adjust other aspects of the recipe for changes in cocoa type. It will effect flavor from what I have read and from what I understand. I’ve made these twice now and they were not only happily devoured, but the moist, spicy, chocolate goodness had people begging for the recipe – Thank you for keeping this site up and sharing such brilliantly creative cupcake ideas! Thank you so much for this recipe it is delicious! I really liked it. Next time I may add more chai spice to the cupcakes it almost wasn’t there in my batch. This is definitely the best cupcake recipe I have ever used I can’t wait to try another one of your recipes! 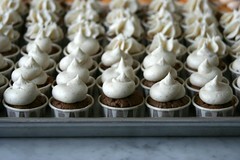 I used this recipe as inspiration for the cupcakes I just served at my wedding and they were a big hit! A friend who has baked professionally volunteered to do the cupcakes and we were discussing flavors when I saw this recipe. I did a few trial runs (decided to leave out the fennel) and sent her the spice mix ahead of time. She put it all together and people LOVED them. So thanks! I made these cupcakes today and they were fantastic! I love your blog. Thank you for posting your recipes in such great detail. It is very helpful for someone who has never baked anything beyond cake mix goods such as myself. 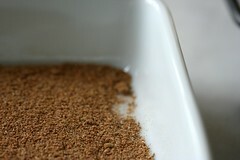 I’m wondering if I can use dried cardamom and use a food processor to grind it to a powder? Can I use any food processor to grind the other spices as well? I made these to end an Indian dinner and they were very good. I added a bit of salt to the icing to balance the sweetness. Now I have leftover chai spice to enjoy! Oh how lovely these look! I want to try these for tomorrow, but I was wondering – for someone who doesn’t like buttercream, what would do as an alternative topping for these? I have made these a few times and they are always a big hit :) The cupcakes are the perfect amount of chocolate-y goodness and moistness and the spiced buttercream always gets a lot of praise. Thanks for posting such wonderful recipes! I just made these this weekend for a wedding shower and they were so good! These are the first cupcakes I’ve made that two days later I’m craving them! I just made these just now and they turned out a bit dry…what did I do wrong? The tops came out very crumbly. Any advice would be great. Thanks! My best guess is that they were over baked. These are rich, moist cupcakes (what with all the eggs and butter), but if they are baked too long they could dry out. I think you’re right. The first batch was for 25 min and they were very crumbly. Then the second round (I got 36 cupcakes out of the recipe) at 20 minutes was a little less dry, but still flaking. Do you have any thoughts on why my my cooking time was so much different from yours? Another note, my mini food processor was actually too big for the fennel and cloves! I found ground cloves at the store and finely minced the fennel by hand b/c they didn’t have ground fennel. All part of the adventure! I have made these and they’re fantastic. Thank you for all your recipies your a Goddess! Hi there – I’m goign to try these cupcakes for a baby shower that will be populated by some big-time foodies. I am going to make these and one other cupcake recipte (maye the coconut lime as someone suggested above), but I am thinking about making them in a mini-cupcake tin as there will be lots of food at the party, and that way, people can sample both cupcakes without fillin gup. Do you have a suggestions for cooking times for mini-cups? And, also, where do you get your little paper cups (I’m in Oakland, so could make the trip into SF to get them) and how full do you fill them when spooning in the batter? Thanks!! !